My niece Kukay celebrated her 20th birthday on Sept. 18, 2011 and this year she'll be 22 already. 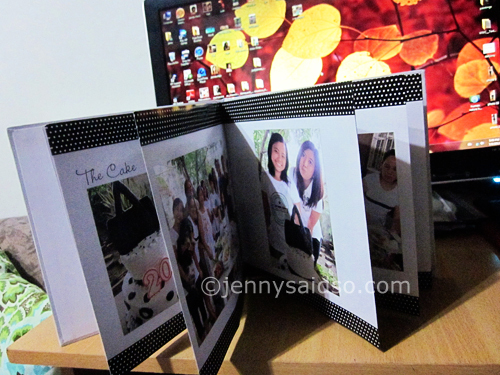 I compiled all our photos during her 20th mini birthday celebration at the house and decided to make a photobook, which as you can see I created on June 21, 2012 and that is almost a year after her birthday. I decided to just make a simple photobook with more emphasis on the photos. Not much designs on every page too. Her color theme for her birthday is black and white so I just used black and white colors on her photobbok as well. Made the layout at my photoshop and it took me several days. Have it printed at Artscow since I also have free photobook coupon. I only paid for the shipping of $8.99 and I got this photobook for FREE. Great deal! This photobook is 8x8 with 20 pages. It took over 3 weeks for processing and delivery since it came all the way from Hongkong so the waiting time is just ok. Love the outcome as usual. Check out my other photobooks.